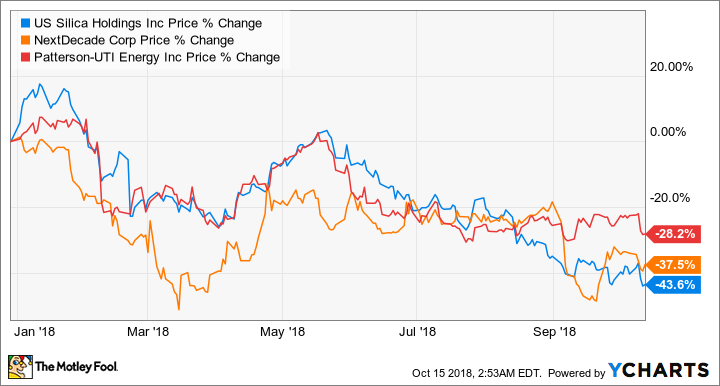 Oil prices are on the rise and lifting the prospects of the entire industry, but shares of U.S. Silica Holdings, NextDecade, and Patterson-UTI Energy are down 25% in 2018. Oil prices are having themselves a year in 2018. Since the beginning of the year, the price of a barrel of Brent crude -- the international benchmark price -- has risen from $65 a barrel to as high as $85 recently (it's about $81 per barrel at the time of this writing). When oil prices rise like that, you'd think that it would lift all boats in the oil and gas industry. That hasn't been the case for fracking sand provider U.S. Silica Holdings (NYSE:SLCA), prospective liquefied natural gas export terminal owner NextDecade Corporation (NASDAQ:NEXT), and drilling rig and oil services provider Patterson-UTI Energy (NASDAQ:PTEN). With so much optimism for oil, but so much pessimism for these stocks, is it time to take a look at these stocks for your own portfolio? Let's take a look at why the market has cast these companies aside and whether that is a long-term investor opportunity. NextDecade isn't much more than a business plan right now, but if it can realize that plan, it could do great things for investors. The company intends to build a new LNG export terminal on the U.S. Gulf Coast. This facility, called Rio Grande LNG, is a monster facility that could export as much as 27 million tons per year of LNG once complete. Management is betting on prolific natural gas production coming as a byproduct of oil drilling in the Permian -- known as associated gas -- that can be sourced for incredibly cheap prices. At the same time, demand for LNG will continue to grow globally as places like the U.S. can supply the market with cheaper supplies. Since the company has yet to put a shovel into the ground, this is an incredibly volatile stock. There are a lot of things that need to happen before it can actually realize this business plan. First, it has to get government approval for the facility, then it has to sign up customers, then it needs to secure tens of billions in funding to get the facility built. While its regulatory process is moving along on schedule, the thing that is likely making investors nervous about its prospects is rising interest rates. According to estimates from other prospective LNG facilities today, the unlevered cost (not including debt costs) to build one of these facilities is in the range of $850 to $1,070 per ton of production capacity. That puts NextDecade's financing needs somewhere between $22 billion and $29 billion. That's a lot of money to raise in a few years, and it will have to do so in a rising interest rate environment. The more it has to shell out in interest payments once this facility is built, the lower the returns. If NextDecade can pull off this business plan, then today's stock price looks incredibly cheap. However, those gains will likely get lower as interest rates rise and make its stock slightly less appealing. Unlike NextDecade, Patterson-UTI Energy is a company with operational assets. It's in two critical business services segments for the oil and gas industry: providing the rigs needed to drill wells, and pressure pumping services to perform hydraulic fracturing, which unlocks the oil and gas from shale. Over the past several quarters, the company's pressure pumping business has been a true bright spot on its earnings reports. Its contract drilling business, on the other hand, has struggled with the need to upgrade its rigs to what the industry calls super-spec rigs needed to drill shale wells, as well as an excess supply of lower-specification rigs impacting pricing power. The one knock against Patterson-UTI is that the costs for those super-spec upgrades are higher than some of its peers, which lowers its rates of return in the long run. According to management, the average upgrade cost for its rigs is $15 million and the payback period for that upgrade is around four years. By comparison, Helmerich & Payne (NYSE: HP), its largest competitor, estimates that its standardized rig designs mean that upgrades to its super-spec rigs are as low as $2 million-$3 million and can have an after-tax payback period of 12 months. Overall, demand for Patterson's rigs and its pressure pumping services will likely keep being high as shale drilling across the U.S. remains a cost-competitive production source. Also, the company is in relatively good financial shape to return cash to shareholders in the form of dividends and share repurchases. That said, the company's higher upgrade costs will likely lead to lower rates of return compared to its peers. It may not necessarily be the best stock among its peer group even though there is certainly some upside in this stock. Of these three stocks, U.S. Silica's decline is the hardest to understand. From a business perspective, 2018 has been a great year. Its earnings results have been solid throughout the year, and management expects the third quarter to also be a good one as sales were up 10% sequentially. Plus, we will get a full quarter contribution from its recent acquisition of EP Minerals, which helps to diversify U.S. Silica away from oil and gas proppant and more into its industrial and specialty product line. On top of the operating performance, management expects to buy back stock as part of its $200 million share repurchase program. The two things that have likely turned Wall Street away from U.S. Silica are its slightly elevated debt levels and fears that frack sand producers have added too much capacity, which will impact pricing. Certainly, higher interest payments will bite into earnings, and management even admitted that pricing this past quarter for some of its sand was weaker because of a slowdown in fracked wells. That said, U.S. Silica's $1.2 billion in debt doesn't sound as outrageous since it has a debt-to-EBITDA ratio of 2.0. Also, as management noted on its second-quarter conference call, more than 80% of its sand deliveries are sold under long-term supply agreements, which protect both volumes and pricing to a large degree. It wouldn't be that surprising if U.S. Silica's stock declines some more. The oil and gas industry is running into transportation and infrastructure bottlenecks that are constraining production. That could put a damper on sand volumes until more pipelines get built. That said, U.S. Silica's stock is trading for a dirt-cheap valuation of 9.2 times earnings. I've been bullish on U.S. Silica's prospects for most of the year, and the case to buy this stock gets more compelling by the day as shares become cheaper.